PELOPONNESOS. ACHAIA. Patrai. Early to mid 30s B.C. Æ hemiobol or hexachalkon. 8.92 gm. 25 mm. Nikostratos, son of Kallistrates, magistrate. 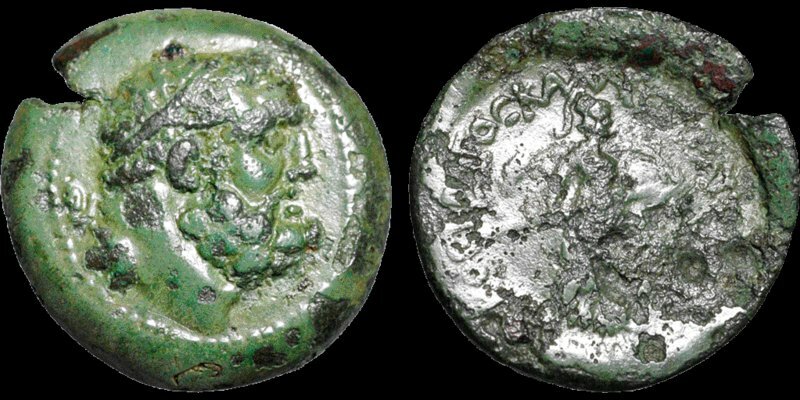 Bearded head of Herakles right, wearing tainia / Athena advancing right, holding shield and spear; palm to left; Patrai monogram to right. Cf. BCD Peloponnesos 518-520. Near Extremely Fine; exceptional portrait; reverse somewhat flatly struck and with some roughness. Exquisite smooth emerald green patina on the undisturbed surfaces (the patination extends into the rougher areas, suggesting the roughness came early in the life of the coin). Ex BCD Collection (with tags). From the Kunst und Munzen A. G. list 53, No. 156 (bought Jan. 84, through Leu).